The following text excerpts a panel on Nov. 17, 2018, at the David Horowitz Freedom Center in Palm Beach, Florida. The panel included Bill Gertz and Anne Marie Waters and was moderated by John Gilmore. For the complete, raw transcript, see the FrontPageMag.com version posted on Dec. 6, 2018. Transcription errors have been corrected and the idiosyncrasies of oral remarks edited for clarity. Daniel Pipes: I'm Daniel Pipes and normally I'm here as a Middle East/Islam specialist. But in part to coordinate with Anne Marie Waters and in part because it's a particular passion of mine, I'm going talk about what I call Europe's civilizationalist parties (and what the press calls far-right parties). Like Anne Marie's For Britain, they are standing up to the Establishment to talk about immigration and Islamization. 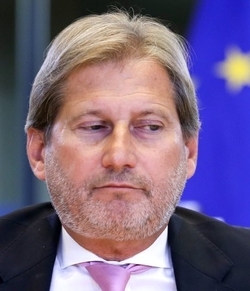 Johannes Hahn, since November 2014 the Commissioner for European Neighborhood Policy and Enlargement Negotiations. In 2015, the EU commissioner for enlargement, Johannes Hahn, said that there might be some 20 million refugees at the borders of Europe wanting to come in. That's a substantial number; but not if you look at economic migrants as well as refugees, at the water and food shortages already existing in the Middle East, and at population growth in Sub-Sahara Africa. An official of Iran's government has said that 70 percent of the country's population will have to leave unless there's some major change to the use of water. In Yemen, some villagers are allotted one liter, or roughly one quart, of water per day. Ethiopia's damming of the Blue Nile has created a looming crisis in Egypt, which overwhelmingly depends on that river's waters. Africa's population is expected to double from 1 billion to 2 billion by 2050, and quadruple to 4 billion by 2100. It's reasonable to say that the number of would-be immigrants to Europe easily matches the number of the population of Europe itself. Including Russia, that is 740 million people. Tens and hundreds of millions of people will want to leave the Middle East and Africa; where will they want to go to? Mostly to the West: especially Europe, the United States, Canada, and Australia. The population of the United States and Canada together is almost exactly half of that of Europe, 360 million. While we in North America are further, modern transportation means that we too will be inundated with immigrants. So, while my specific subject is Europe, it also has clear implications for the United States and Canada. I shall make four points about Europe's civilizationalist parties. First, they are many and they're coming on strong. Some of them are well known like the National Rally in France, the League in Italy, the Freedom Party in Austria, the PVV in the Netherlands, and the Sweden Democrats; others are less known. All are in revolt against the elites, or what I call the six Ps: police, politicians, press, priests, professors and prosecutors. Civilizationists are already in government in a small way in three countries: Norway, Switzerland, and Slovakia. They have major roles and are the driving force in five countries; Poland, Hungary, Czechia, Austria and Italy. I expect they will be powerful in more countries to come, such as France, the Netherlands and Sweden. Germany is of particular interest. 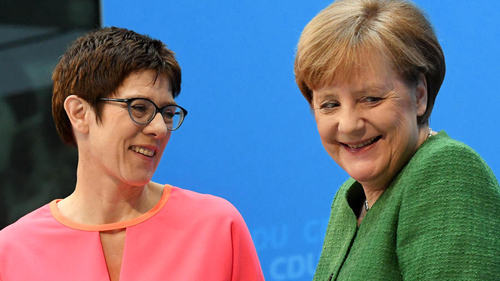 The ruling party, the CDU, will hold its congress on Dec. 7-8 and its vote for a new party leader is critical for the future of Europe: Angela Merkel has Annegret Kramp-Karrenbauer, or AKK (or Mini-Merkel), her would-be successor, in place. If AKK does succeed, Germany will continue down the Merkel path of mass immigration and Islamization. If either of the other contestants, former faction leader Frederick Metz or (more interestingly) Health Minister Jens Spahn, succeed, that will augur a dramatic shift in Germany, the largest and arguably the most powerful and important country in western Europe. So, my first point is, civilizationalists are on the march. Secondly, yes, almost without exception they are highly problematic. In many cases, they're staffed by neophytes. They contain disturbing numbers of cranks, anti-Jewish and anti-Muslim extremists, racists, power-hungry oddballs, conspiracy theorists, historical revisionists and Nazi nostalgists. Autocrats run their parties. They take money from Moscow. They're anti-American. There are all sorts of problems with these parties, no question. Thirdly, civilizationalist parties have a crucial role. Where they do not sit in parliament, as in Britain and Spain, you see things go more rapidly downhill. Where they do sit in parliament, you see a push back, That's why it's so important that a party like For Britain get into parliament, and in numbers. Finally, civilizationalist parties have several paths to power. They can rule on their own, as in Hungary. The Fidesz Party with Viktor Orbán at its head has two-thirds the seats in parliament, meaning it can do what it wants – and (from an American point of view) it does too much: it controls the judiciary, the economy, the media, the schools, and much else. But that's one way: win outright. Or civilizationists can join with a legacy conservative party, as in Austria, where the Freedom Party joined forces with the traditional conservative party, the People's Party. Together, they won 58 percent of the vote and run the country between them. Or the most exotic path to power is where the civilizationalist party joins with an anarchist/left wing party, as in Italy. The League formed a coalition with the Five Star Movement. It's been a wild ride, with the League gaining much popularity at Five Star's expense. What will happen when civilizationist parties reach power? The easy thing for them to do is to stop illegal immigration; if they have the will, they can do it. They can also expel criminal illegal migrants. But those are rather small steps compared to the difficult problems that lie ahead, such as expelling non-criminal illegals and integrating legal immigrants. But at least Europeans are waking up to these problems and want to effect change. I urge you to watch the situation, not only because Europe has three-quarters of a billion people and is the source of our civilization, but also because what happens there directly affects us. 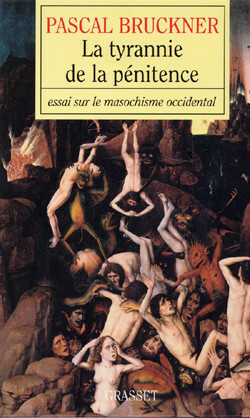 Pascal Bruckner wrote the book on Europe's sense of guilt. Pipes: Europeans have a profound sense of guilt over the satanic trio of imperialism, racism and fascism. Guilt means believing your civilization is inherently bad, that you brought bad things to the rest of the world, even that your white skin is a sign of evil. These are the fundamental sentiments that lie behind wanting to bring in a new population and eradicating an old civilization. It is a profound sentiment primarily found among the elite, flourishing among the six Ps: again, that's the police, politicians, priests, press, professors and prosecutors. It is not found so much among the general population whose eyes are increasingly open. I foresee a coming revolution. It's already started in 5 countries out of the 28 of the European union and it's going to be felt in more of them as civilizationists reach power. I predict that in 20 years these parties will be in power through most of Europe. Audience Question: It seems like there's a natural linkage between these nativist parties and Europe's Jews because they both want to de‑Muslimize the continent. Can be an alliance between while the parties still have a Nazi tinge and Jews fear them? First, non-civilizationists are often worse. 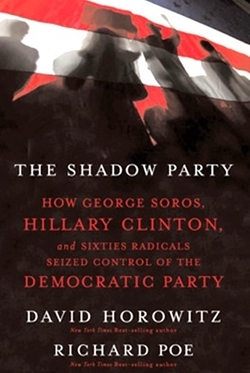 While Viktor Orbán is condemned for his anti-George Soros campaign; I note that our host, the Horowitz Center, has also condemned Soros; does that make David Horowitz an antisemite? Further, how can one focus on Orbán when Jeremy Corbyn's overt antisemitism and friendship with Hamas, could be the next UK prime minister? Note that Orbán is Israel's best friend in Europe while Corbyn would probably break relations with it. Note that Israel now has better relations with Saudi Arabia than with Sweden, with Egypt than with Spain. Second, civilizationists are improving in this regard. I gave you the example of Marie Le Pen. Let me offer you another: In 2010, Heinz-Christian Strache, the head of the Austria's Freedom Party, dutifully went to the Holocaust memorial in Jerusalem, Yad Vashem, but he wore the beer cap of his brotherhood (Burschenschaft), which is tainted with antisemitism, prompting much disgust. He returned to Yad Vashem in 2016 and this time he wore a homburg with no associations whatsoever. So, he learned. Yes, there are problems concerning Jews. But generally, civilizationists are better than their opponents and improving. To answer your question, there can be alliances. Note the just-formed "Juden in der AfD," Jews of the Alternative for Germany.